IC Insights has revised its outlook and analysis of the IC industry and presented its new findings in the Mid-Year Update to The McClean Report 2017, which originally was published in January 2017. Among the revisions is a complete update of forecast growth rates of the 33 main product categories classified by the World Semiconductor Trade Statistics organization (WSTS). Figure 1 shows the complete ranking of IC products by forecasted growth rate for 2017. Topping the chart of fastest-growing products is DRAM, which comes as no surprise given the strong rise of average selling prices in this segment throughout the first half of 2017. IC Insights now expects the DRAM market to increase 55% in 2017 and lay claim as the fastest-growing IC product segment this year. This is not unfamiliar territory for the DRAM market. It was also the fastest-growing IC segment in 2013 and 2014. Remarkably, DRAM has been at the top and near the bottom of this list over the past five years, demonstrating its extremely volatile nature (Figure 2). The Industrial/Other Special Purpose Logic segment is projected to grow 32% and two automotive-related IC categories—Automotive Special Purpose Logic (48%) and Automotive Application Specific Analog (18%)—are also on course for growth that will exceed the 16% expected of the total IC market. There are more IC categories that are forecast to show positive growth in 2017 (29) compared to 2016 (21), but only the top five market segments mentioned above are forecast to exceed the total IC market growth in 2017, indicating top-heavy market growth. 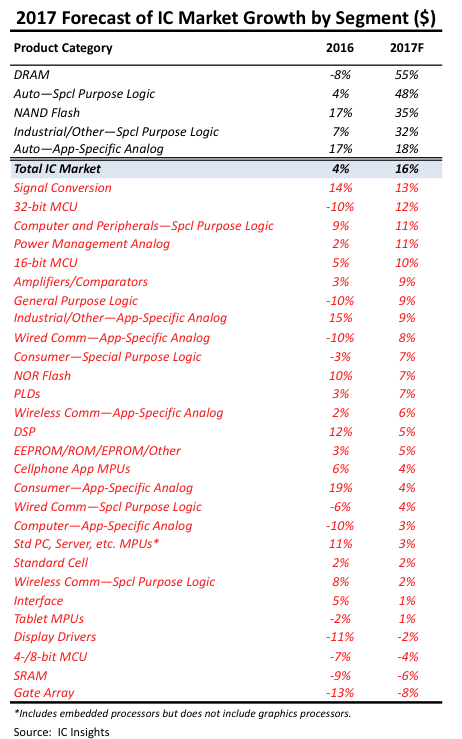 Another five segments (two analog categories, two MCU segments, and Computer and Peripherals—Special Purpose Logic) are forecast to show double-digit growth in 2017, though less than the 16% forecast for the total IC market this year. Additional details and discussion regarding the updated IC forecasts for the 2017-2021 timeperiod are covered in IC Insights’ Mid-Year Update to The McClean Report 2017.